Welcome to Farraday Country, a contemporary twist on 7 Brides for 7 Brothers. 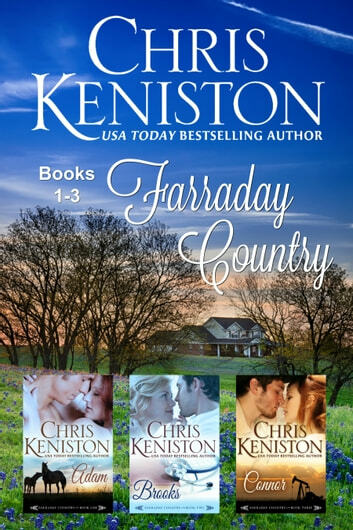 Complete with swoon worthy heroes, this bestselling series is set in cattle-ranching West Texas and filled with all the friends, family and fun that fans have come to expect from USA TODAY Bestselling author Chris Keniston. This heartwaarming collection includes books 1-3 of the Farraday Country series. Adam - On a barren road in the pre-dawn hours, Adam Farraday happens upon a secretive redheaded beauty searching for a disappearing dog. Runaway bride Meg O’Brien is stranded in Tuckers Bluff with no money and nowhere to go. Can she resist falling in love with her handsome rescuer when he’s decided she’s the one for him? Brooks - On the way to his family's ranch, Dr. Brooks Farraday encounters a beautiful stranger in the road petting a stray dog. On her way to a friend’s wedding in Texas, the last thing Toni Castellano needs in her life is another man. Could their friendship lead to the real thing or will falling in love come at too high a price? Connor – After years of dangerous work in the oil fields, Connor Farraday finally has enough money to purchase the land his neighbor once promised him. When Catherine Hammond inherits her grandfather’s West Texas ranch, settling his affairs doesn’t go as planned. Will they realize that the biggest surprises in life often lead the way to happy ever after? "Chris Keniston gives us a world you'll never want to leave." Emily March, New York Times Bestselling Author of Eternity Springs series. Love is felling the mighty Farraday men one by one.... Three great stories all with their own twist to finding Mrs. Farraday. Can’t wait to read the next stories. Loving the evolution of the Faraday brothers as they find love in mysterious ways. Wholehearted funfilled pleasant read full of everyday situations. I know I am hooked and won't stop until I read all the books in the series. 7Bfor7B is one of my favorite movies. I loved all 3 of there books and can't wait to read the rest of the series. Each story was really done in good taste and you wanted the couples to make it.